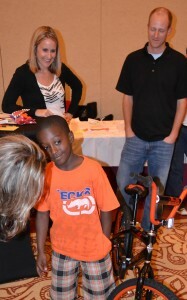 Florida Hospitals met to build some bikes, and become a better team in Orlando, Florida. Under the spell of Disney, that makes anything possible, they played dress up, and created a little magic for area kids. Viking hats, and horns aside, there was learning to done and bikes to be built. The participants learned how to be part of a team – earn a part, and Build-a-Bike Team Building Event. These wildly-dressed marketers, had a fun time building their team, learning how to negotiate, and experience the value of collaboration. The final result was a bunch of shiny two-wheelers and a lot of smiles. Eight little ones were surprised by what the Florida Hospitals marketing department did for them. Yes, some of them were pretty shy, and not all of them knew how to ride. So they got some lessons from some folks who want them to do well in life. They visited, had their pictures taken and just kept asking, “Do I really get to keep the bike?” Of course. These kids have felt the pain of the recession, and know what it is like to go without. Today, they learned what it was like to get something, because they are good students and nice kids. Florida Hospitals has been around for over 100 years. And they want you to reach 100 years as well. Part of their philosophy is all about healthy living. Numerous events center on helping you understand how to live longer and live healthier. By Connie Timpson/Sr. Team Building Instructor/Performance Coach/The Leader’s Institute and The Build-A-Bike Team Building Event.